“I know you are interviewing me here, and you’re doing a great job. I also would like to interview me,” Sandler said, leading neatly into Fallon’s introduction for Lip Flip. The comic actor went on to promote his new movie “Pixels” in the creepiest way possible as the pair swapped mouths, before taking the opportunity to make fun of Fallon. After mocking each other without mercy, the cheeky pair wrapped up the skit with a duet of “To All The Girls I’ve Loved Before,” with a few new naughty lyrics of course. 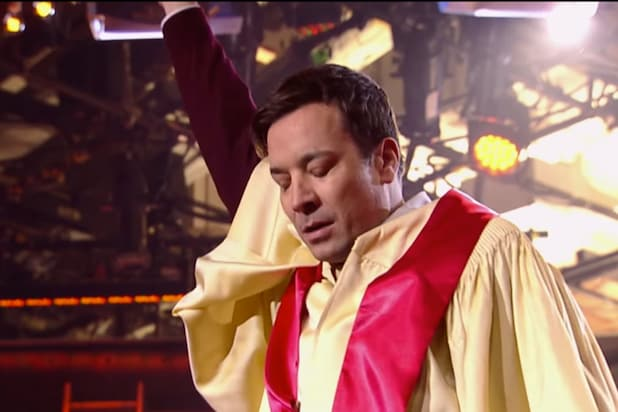 Sandler is the latest in a growing list of celebrities to perform the Lip Flip with Fallon. Kerry Washington did a “Scandal” duet with the late-night host, Jennifer Aniston debated the Super Bowl with Fallon during a Lip Flip segment, and British comedian Ricky Gervais could barely contain himself when he performed a Lip Flip.